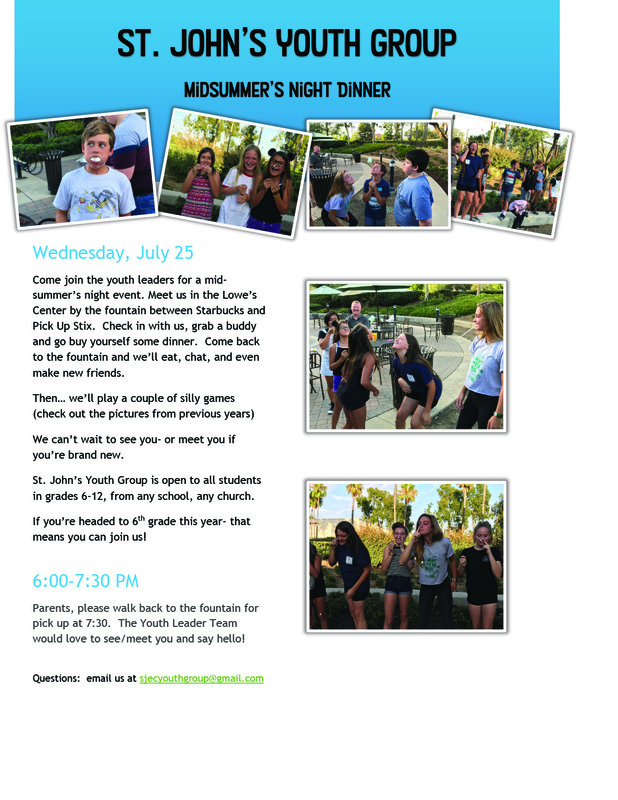 MIDSUMMER’S NIGHT YOUTH DINNER (SEE FLYER FOR ALL DETAILS) — WEDNESDAY, JULY 25, 6 P.M.
“Hey gang! We’re looking forward to seeing you Wednesday, July 25 for our annual MidSummer’s night dinner. Come see us — we miss you! “We hope to see you tomorrow! Make sure your noses are clean/clear! (most of you know what that means — for the newbies, come and find out — it’s hilarious!). “We also want to let you know the church/school community is having a Variety show and dinner event Sunday, October 14. Lisa Naulls (Jonathan’s mom and the one with THE Voice ( 🙂 wants to know if any youth would like to be involved in the variety show part of it. There will be some rehearsals, beginning sometime mid/late August after church on Sundays. If you’re interested, please email Lisa via church@stjohns-es.org”. St. John’s Youth Group is open to all students in grades 6-12, from any school, any church. If you’re headed to 6th grade this year- that means you can join us!